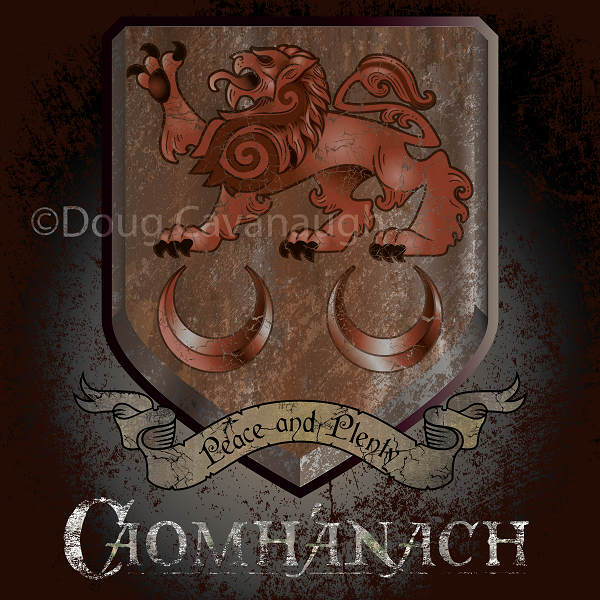 Stylish apparel featuring the Clann Caomhánach (Kavanagh) family Crest. 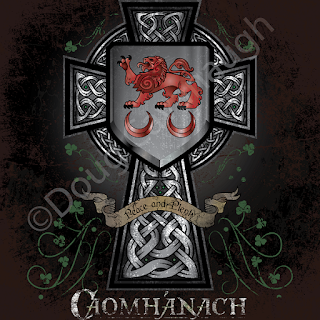 Clan Crest 2.0 and a Celtic Cross/Clan Crest combo! 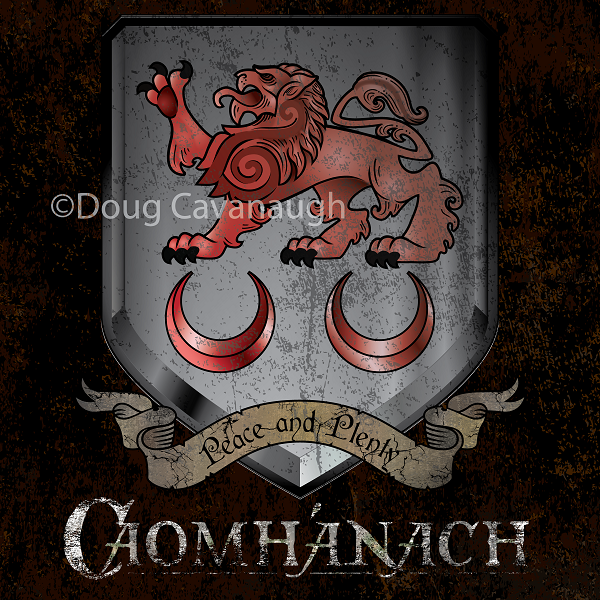 So, I have been doing lots of designing for my main site, celtic hammer club, but I haven't posted a Caomhánach design in quite a while. All the practice with my other designs have taught me some new techniques and ways of taking my artwork to the next level. 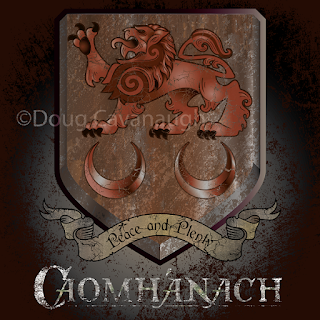 I was excited to apply some of these new skills to the Caomhánach crest. FIRST, I redid the lion passant. I took my time and added additional details and redid the shading to give it a more professional, 3-d look. I also redid the shading on the crescents. Once the new crest was complete I went about creating a new shield to place it on. I have become obsessed with creating textured, weathered, distressed looks to my artwork, so the first shield I did was a very rusty one. I wanted it to look like it had been buried in the ruins of a clan castle for centuries. I also created a scroll with the family motto of "Peace and Plenty" on it. All of the different details like the cracks in the crest and the scroll, the various colors that make up the rust, and all of the other details are painstakingly layered on top of each other and adjusted until I'm happy with the end product. This is actually a lot of work and not as simple as just copying and pasting a bunch of stuff together, but it's fun. I enjoy fooling around with color balances, gradients, opacity, and all the other components until it looks just right to my eye. The only thing I DON'T enjoy is when my program continuously crashes from all the complexity in these very detailed pieces. 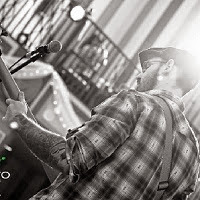 I often lose a few steps that I hadn't saved yet, and my Irish temper lets loose! The "shiny" version is still quite distressed and weathered, but it looks to be in a lot better shape than the rust covered one. I played around with a totally distress-free, super-metallic version of the shield, but it looked too bright and cartoony to me. So, I did not complete that version. 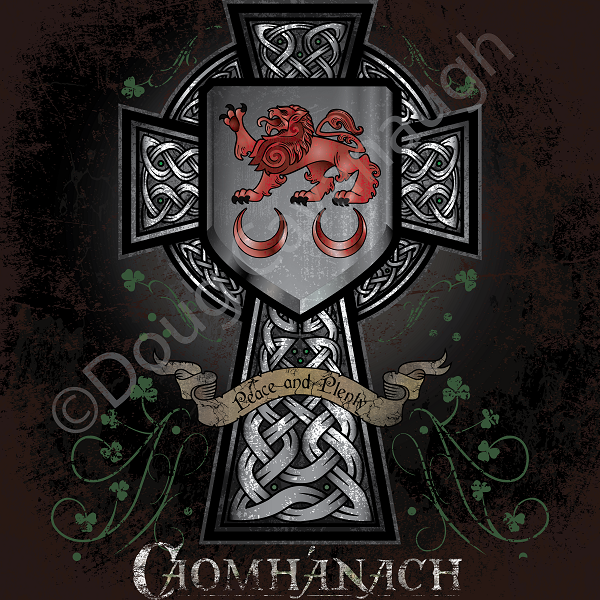 Finally, I combined the shiny shield version of the crest with one of my original Celtic cross designs (to see images and shop for apparel with just my original Celtic cross on it (without the crest), click the link HERE). I also added some shamrock ornamentation. I'm really fond of the Celtic cross design because it's all original artwork. A lot of graphic designers use stock Celtic crosses in their work, and while the image is cool, you see the same crosses on tee shirts and logos everywhere. In this case, you're getting all original stuff done by me which makes it much more distinctive. So that's it for now. I always like to point out that I always use the original Gaelic spelling of the surname in my designs, Caomhánach, as opposed to favoring one of the many anglicized spellings (Kavanagh, Cavanagh, Cavenagh, Cavanaugh, etc.). I think the original Gaelic honors the true roots of the surname, and it also makes it marketable to anyone with any version of the name because every variation is rooted in that same Gaelic surname. Don't forget to check out my Redbubble page to see all the cool accessories you can get with this artwork on it! 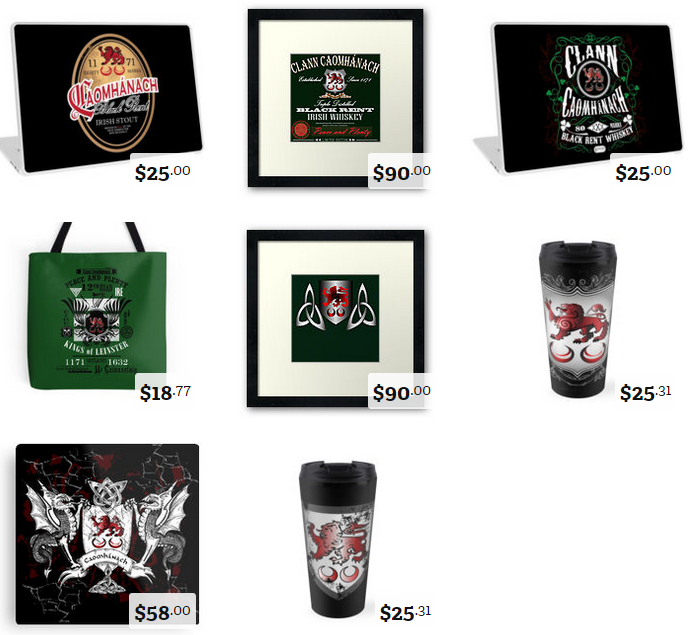 Lots of goodies on my Redbubble page! GET PHONE CASES, STICKERS, POSTERS, AND MORE! 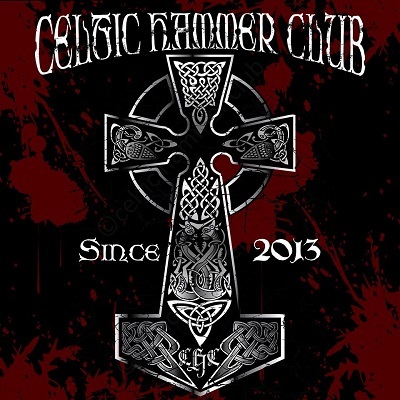 © Douglas Cavanaugh and Celtic Hammer Club, 2013 - 2014. Unauthorized use is strictly prohibited. Awesome Inc. theme. Theme images by Ollustrator. Powered by Blogger.